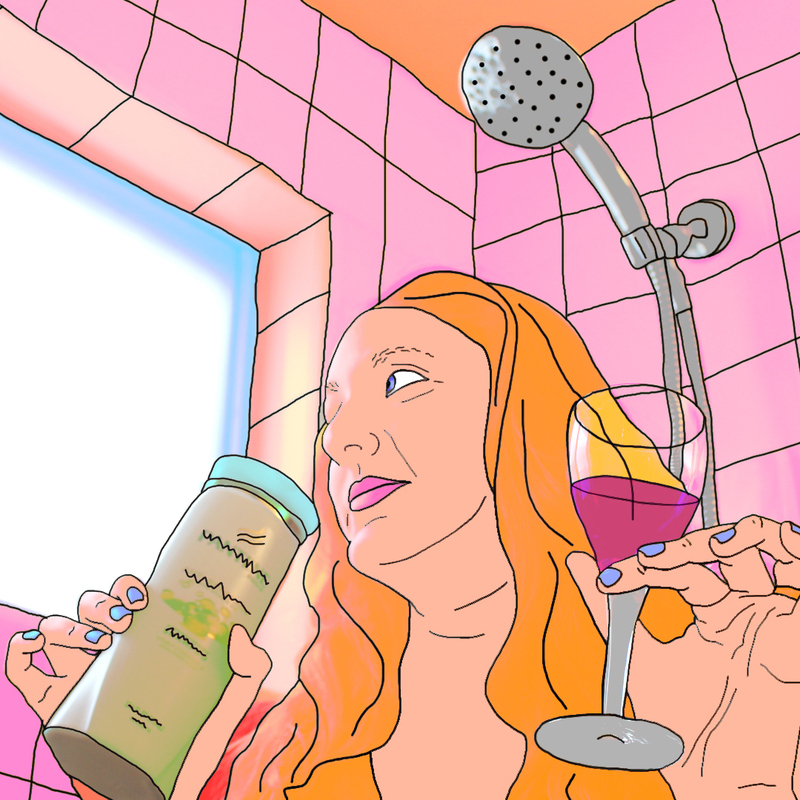 With high temperatures, competing smells and water flying everywhere, the shower is a challenging place to drink wine. But also a rewarding one, especially if you find yourself with little time to yourself over the holidays. With forethought and some specialized equipment, it's possible to lather, sip and repeat with no issues. 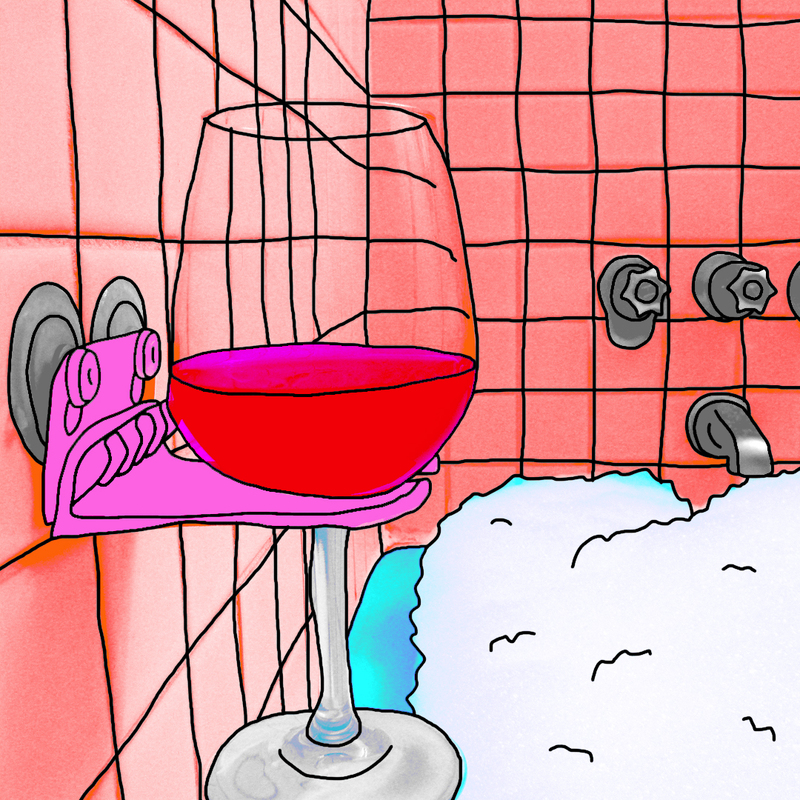 Here, our guide to drinking wine in the shower like a pro. 1. Prepare an ice bucket. In our tests, a glass of wine's temperature rose by 10 degrees during the first four minutes of shower drinking. To counteract this effect, you'll want to start your wine extra-cool. Whites can be refrigerator cold, and reds should be about 55 degrees. The best strategy is to keep your bottle in a bucket of ice just outside the shower, perched on a sink or toilet tank, and reach out to refill as required. 2. Make sure you have somewhere to put your glass. Surfaces in a shower are made to tilt inward, which is great for keeping water contained but not ideal for resting a delicate wine glass. It's smart to invest in a Wave Hooks shower wine glass holder, a product that originated on Kickstarter and is now just $12.50 on Amazon. Make sure the suction cups are securely bonded to your tile, since there's no worse nightmare than dealing with broken glass when you're all wet and soapy. You need a glass with a smallish opening, to keep out shower water. If you have the above equipment and feel comfortable with real glass, our favorite is the Riedel Veritas Champagne Glass, which has a narrow lip diameter but enough girth to swirl and sniff any white or red. Otherwise, use a stemless, shatterproof GoVino. 4. Choose a refreshing wine. You might enjoy a rich, tannic Bordeaux with beef stew when it's freezing outside, but in the shower a big wine will make you feel gross. The pairing that matters here is hot with cold, so you need a wine that's refreshing and tastes good chilled. Most whites will work, but don't forget about light-bodied reds like Gamay, cool-climate Pinot Noir and Austrian Zweigelt. 5. Pair with your products. The frothy Spanish sparkling wine often has an earthy note that pairs well with a mild grassy or milky bar soap. This spritzy, low-alcohol wine from Portugal is the best thing to drink when the weather is hot and humid, as it is in the shower. Its scent is clean and neutral, so it won't clash with other bathroom smells. Whites from this region in France's Loire valley smell like citrusy sea air. Choose one of these crisp Sauvignon Blancs if your shampoo's label contains the word "mist" or "breeze." Germany's signature white grape produces wines with apricot and peach flavors, which echo the stone fruit notes in sweeter-smelling products. Some of this region's best wines smell like fresh-cut flowers. They're ideal with floral shampoos and conditioners.